The resort of St Paul’s Bay on the north east coast of Malta, once a quiet fishing village is now a pleasant friendly and welcoming resort to all visitors. A CITO tour by air. The many shops and cafes offer excellent service, local food and wine. The Promenade is directly in front of the hotel, ideal for a relaxing stroll after dinner. DAY 1: Your Door to Door service will transfer you to the airport for your flight to Malta. On arrival our local coach will transfer us to the Dolmen Resort Hotel, our base for the next 9 nights. Full day excursion to Valletta, Malta's capital. This World Heritage City was built by the Knights of St John and is a Baroque masterpiece. Visit the Upper Barrakka Gardens and the Malta Experience, an audio-visual spectacular showing the most important events of Maltas history. The Island of Gozo, famed for its character and places of interest such as the Calypso Cave Dwerja and Ggantija Neolithic. Gozo's finest attribute is Ramla Bay whose lurid red sand and crystal clear turquoise waters make it one of the finest beaches in Europe. The Ta Qali Craft's Village where there will be a chance to see the traditional crafts of Malta, including pottery, silver and gold filigree, lace-making, glassblowing and furniture making. San Anton Gardens and Palace, probably the best known gardens on the island. They are a botanical delight with mature trees, old stone urns and fountains, ponds and more formal flower beds. 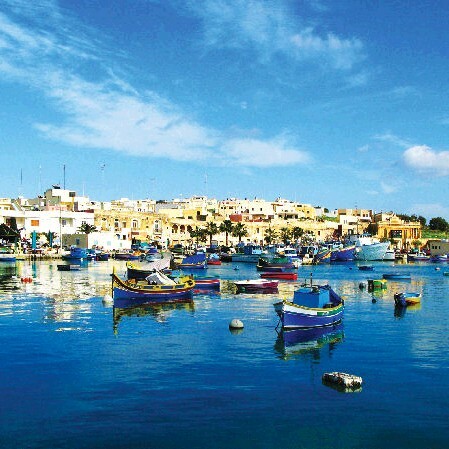 Leisurely harbour cruise around the bay where there will be a chance to see the beautiful coastline of Malta. Mosta, whose Parish Church has the 3rd largest unsupported dome in Europe. Drive on to Rabat to the impressive St. Pauls Catacombs complex. Walk through the narrow street of the Silent City of Mdina, admiring the magisterial Palace and Medina Cathedral. The Domus Romana House, the last remaining Roman house from the 1st Century left on Malta. During excavations, a number of fine polychrome mosaic pavements were uncovered and are said to be some of the best-preserved artefacts outside of Italy. The village of Dingli and Dingli Cliffs, reaching a height of 300 metres and from here we will get spectacular views of Malta. 2 full days and 3 half days at leisure to enjoy the hotel facilities or to sightsee further at your own pace. DAY 10: Today we leave the Island of Malta, our local coach will transfer us to the airport for our return flight and your Door to Door service home. Located on the sea-front overlooking St Paul's Bay, the hotel has a private beach, 4 swimming pools, a Spa and free Wi-Fi throughout. The en-suite rooms are all air-conditioned and have mini-bar, satellite TV, hairdryer and safety deposit box.